English natural philosopher Isaac Newton bought his first prism in 1666, one year after Italian natural philosopher Francesco Grimaldi’s work on diffraction was published. Newton claimed that Grimaldi’s diffraction was simply a new kind of refraction. He argued that the geometric nature of the laws of reflection and refraction could only be explained if light was made of particles, which he referred to as corpuscles, since waves don’t tend to travel in straight lines. Advocates of the wave theory had previously stated that light waves are made of white light, and that the colour spectrum that can be seen through a prism is formed because of corruption within the glass. This means that the more glass the light travels through, the more corrupt it will become. 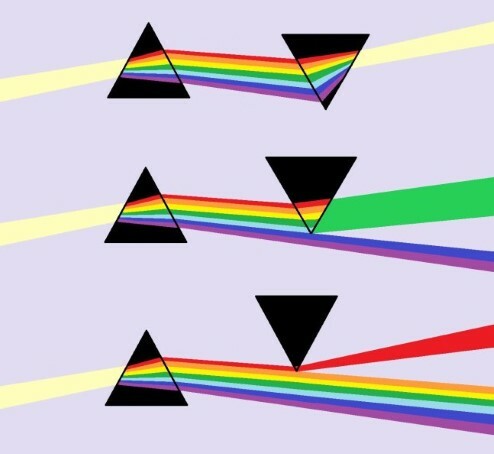 In order to prove that this was false, Newton passed a beam of white light through two prisms, which were held at such an angle that it split into a spectrum when passing through the first prism and was recomposed, back into white light, by the second prism (as shown in Figure 3.1). This showed that the colour spectrum is not caused by glass corrupting the light. Newton claimed this was a ‘crucial experiment’. A crucial experiment is any experiment devised to decide between two contradictory theories, where the failure of one determines the certainty of the other. Since almost everyone agreed that light must be composed of either particles or waves, Newton used the failure of the wave theory to prove that light is made of particles. Newton concluded that light is composed of coloured particles that combine to appear white. Newton introduced the term ‘colour spectrum’ and although the spectrum appears continuous, with no distinct boundaries between the colours, he chose to divide it into seven: red, orange, yellow, green, blue, indigo, and violet. Newton chose the number seven because of the Ancient Greek belief that seven is a mystical number. Newton showed that every colour has a unique angle of refraction that can be calculated using a suitable prism. He saw that all objects appear to be the same colour as the beam of coloured light that illuminates them, and that a beam of coloured light will stay the same colour no matter how many times it is reflected or refracted. This led him to conclude that colour is a property of the light that reflects from objects, not a property of the objects themselves. Many other members joined Hooke in criticising Newton’s particle theory. Some denied that Newton’s colour spectrum existed at all and others denied that his 44th trial really proved that light is not composed of waves. Those that tried to replicate Newton’s experiment often failed. Prisms were still not commonly accepted as scientific instruments. They were sold as simple forms of entertainment, and there was little technical work on their design or improvement. Venetian glass was regarded as the standard against which other glasses were compared but even this was full of air bubbles and flaws. Newton did not help matters by concealing the details of his trials. He did not explain how to produce a spectrum from the first prism or specify the size or geometry of the second. It was not until 1676, four years after Newton’s initial publication, that he performed more trials and gave people enough information to be able replicate them. Newton finally stated that the best prisms to use were those made in London, not Italy, as these were the clearest. Newton stated that those who failed to replicate his experiments must have been using bad prisms, but this was often seen as an excuse and Newton eventually withdrew from debate on the subject. In 1678, Dutch natural philosopher Christiaan Huygens claimed to have disproved Newton’s theory by showing that the laws of reflection and refraction can be derived from his wave theory of light. Huygens argued that diffraction occurs because of the interference of wavefronts. When light is pushed through a small slit, waves are pushed together at different angles and this creates fringes of light and dark shadows, an interference pattern. This is how water waves behave when they pass through a small gap. 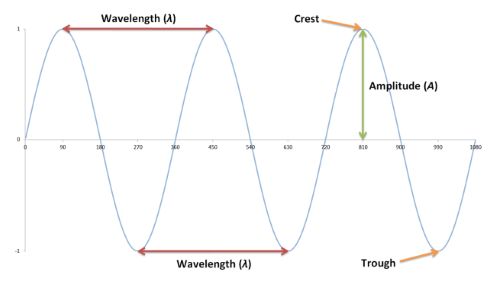 Huygens believed that light waves differ from water waves in one respect: water waves are transverse, the waves move up and down like a sine wave while the water moves forwards. Huygens thought that light waves were longitudinal, moving in a parallel direction to the beam. Sound is an example of a longitudinal wave because sound waves move forwards by periodically displacing molecules in the air, but the molecules themselves do not move forwards, they simply vibrate. In order for light to move through space as either type of wave, it must have a medium to propagate through. This means that Huygens’ theory, like all theories of light before it, was reliant upon the idea that the universe is filled with Aristotle’s fifth element, the aether. The direction of oscillation and propagation of longitudinal and transverse waves. When Bartholin rotated the crystal, he saw that one image disappeared while the other rotated with it. This led him to conclude that something in the crystal had split the beam of light into two different rays. Bartholin referred to this as “one of the greatest wonders that nature has produced”, and saw it as advocating Huygens’ wave theory of light. Double refraction within a calcite crystal. Huygens suggested that Bartholin’s findings could be explained if the crystal contained two different materials, one that produced spherical waves, and one ellipsoidal. Huygens continued Bartholin’s experiments and found that if he placed two crystals next to each other, then the number of images varied, depending on whether the crystals were placed parallel or perpendicular to each other. This was something that his wave theory of light could not explain (discussed further in Chapter 5). Newton interpreted Huygens’ findings in terms of his own particle theory of light. He suggested that the experiments with the calcite crystals showed that light has ‘sides’, something that could easily be understood in terms of particles. Newton also used the publication of Opticks to defend his stance on diffraction. In order to do so he had to appeal to wave-like properties, and argued that particles of light create waves in the aether. After the publication of Opticks, Newton’s theory gained considerable popularity but some of his critics remained unconvinced. There was one way to experimentally determine which theory was correct: if light is composed of particles then it should travel faster in a denser medium, but if it’s composed of waves then a denser medium should slow it down. This experiment would not be conducted for another 150 years, but by the end of the 1800s, both theories would be proven wrong. ↑ Schaffer, S. in The Uses of Experiment: Studies in the Natural Sciences, Cambridge University Press, 1989. ↑ Newton, I., Philosophical Transactions of the Royal Society 1672, 80, 3075–3087. ↑ Takuwa, Y., Historia scientiarum 2013, 23, 113–140. ↑ Ede, A., Cormack, L. B., A History of Science in Society: From the scientific revolution to the present, University of Toronto Press, 2012. ↑ Newton, I., Opticks, William Innys, 1730 (1704). ↑ Hooke, R., The History of the Royal Society 1757 (1672), 3, 10–15. ↑ Huygens, C., Treatise on Light, translated by Thompson, S. P., University of Chicago Press, 2005 (1678). ↑ Smith, A. M., Descartes’s Theory of Light and Refraction: A Discourse on Method, American Philosophical Society, 1987. ↑ Bartholin, E., Experiments with the Double Refracting Iceland Crystal which Led to the Discovery of a Marvelous and Strange Refraction, Brandt, 1959 (1669). ↑ Kahr, B., Claborn, K., ChemPhysChem 2008, 9, Copyright Wiley-VCH Verlag GmbH & Co. KGaA. Reproduced with permission, 43–58. ↑ Buchwald, J. Z., Feingold, M., Newton and the Origin of Civilization, Princeton University Press, 2013.